There is a web site out there, at least one, named Ugly Food Tastes Better. I have to heartily agree. Sometimes the messiest looking dinners taste the best. Tonight I did another brinner. You know, breakfast for dinner. Mostly local. It proves you can eat well using locally sourced items, even in the fall when the weather is bad. Omelet with local veggies in it. Local sausage, and local bread. The bread, Atwater’s rosemary Italian, toasted and drizzled with brown butter. The sausage, TLV farms pork sizzlers with sage. The omelet. 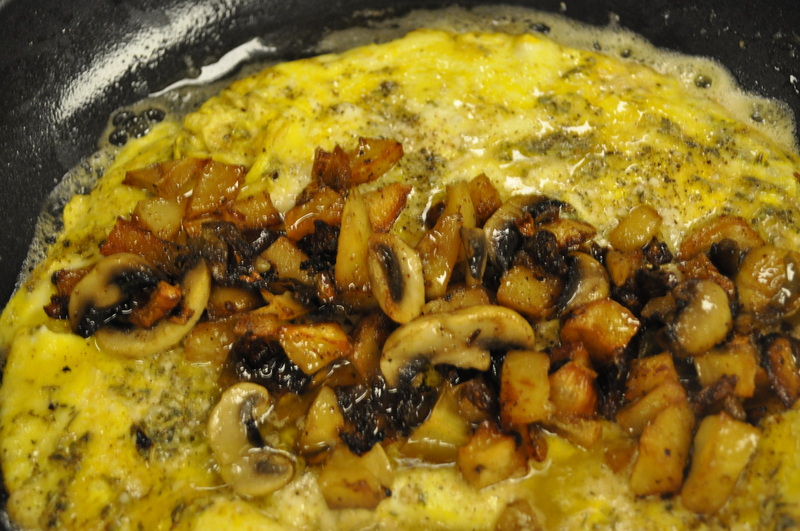 TLV eggs with Roots domestic parmesan, and a hash brown mix made with TLV potatoes, CSA green pepper and onion. Most of the dinner slow cooked in the oven while we worked outside. 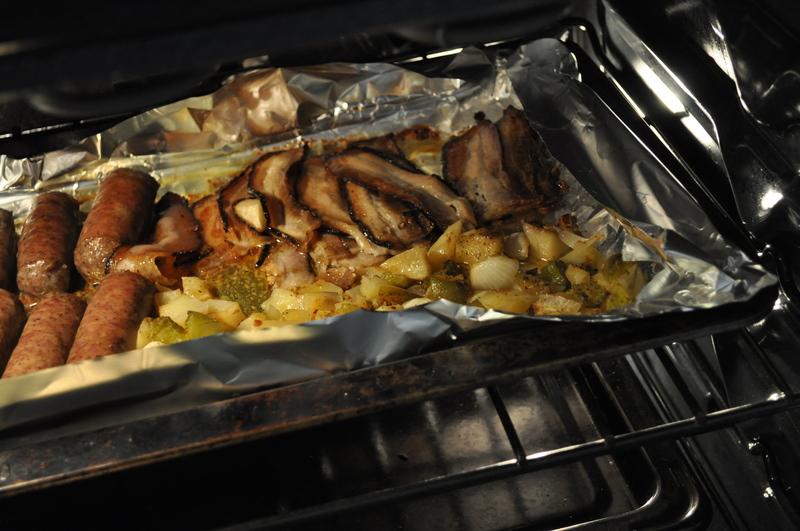 The bacon, from Boarman’s was also in there so I could have bacon for salads and for soups. It was smoked bacon bought a while back. I also added mushrooms from Mother Earth, a PA company. They were bought at Boarman’s too. 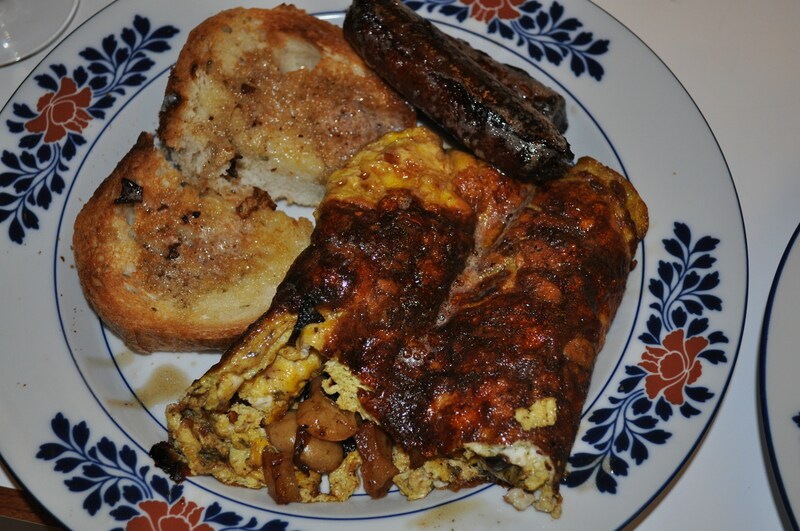 As the omelet cooked, I added all the goodies down the middle. 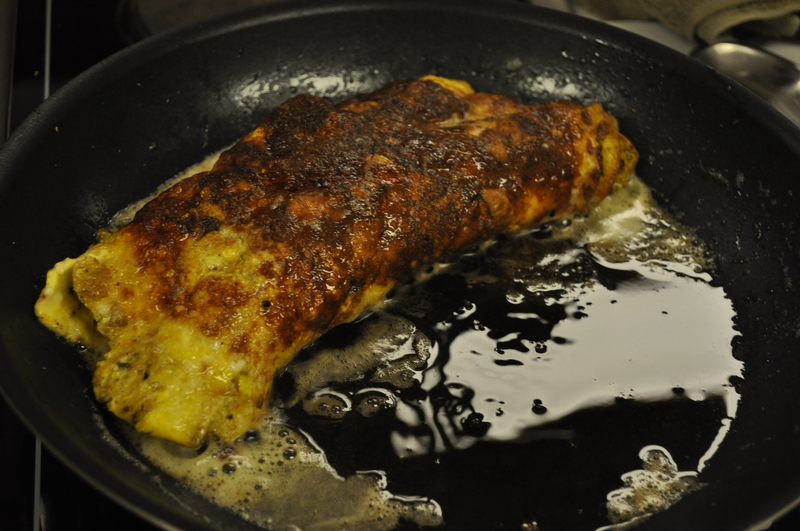 The omelet was perfectly cooked in butter bought at Baugher’s. Not completely local, but from Troyer’s, an Amish company in Ohio. The browned butter left in the pan was soaked up by the toast made with Atwater’s bread. Not a bad way to have dinner. And, to celebrate the snow looking to miss us. Thankfully. Posted in Farmer's Markets, Food, Local Businesses, Locavore, Real Food and tagged cooking, farmer's markets, Food, Howard County, local businesses, Locavore, real food. Bookmark the permalink. I know exactly what you mean! What a fun lighthearted post – anything to do with food and I love it! I’m sure it was delicious. I’m drooling over your local foods. How clever of you to pop it in the oven to prolong your outside time. I say amen to easy meals and a good dose of fresh air. I have to admit. We are really lucky around here. The farm down the road, TLV, has wonderful meat and eggs. Other local farms have high tunnels so we get veggies longer. Between the CSA and the markets, we can eat locally all year round.